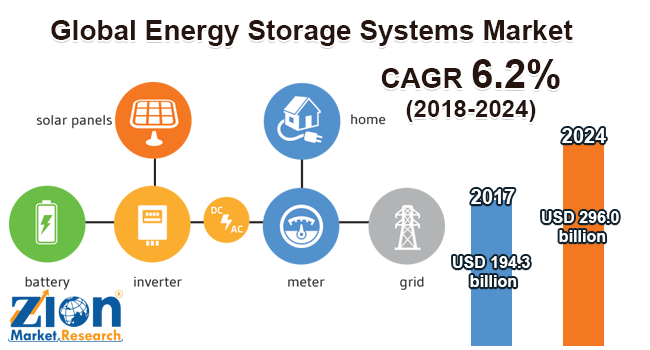 Global energy storage systems market expected to generate revenue of around USD 296.0 billion by the end of 2024, growing at a CAGR of around 6.2% between 2018 and 2024. Growing focus on energy management to achieve increasing demand for electricity is expected to increase the use of energy storage systems over the forecast period. The report covers forecast and analysis for the energy storage systems market on a global and regional level. The study provides historical data from 2015 to 2017 along with a forecast from 2018 to 2024 based on revenue (USD Billion). The study includes drivers and restraints for the energy storage systems market along with the impact they have on the demand over the forecast period. Additionally, the report includes the study of opportunities available in the energy storage systems market on a global level. In order to give the users of this report a comprehensive view of the energy storage systems market, we have included competitive landscape and analysis of Porter’s Five Forces model for the market. The study encompasses a market attractiveness analysis, wherein technology segment, application segment, and end-user segments are benchmarked based on their market size, growth rate, and general attractiveness. The study provides a decisive view of the energy storage systems market by segmenting the market based on technology, application, end-user, and regions. All the segments have been analyzed based on present and future trends and the market is estimated from 2017 to 2024. Based on technology, the energy storage systems market is segmented into compressed air, pumped hydro storage, lithium ion, sodium sulfur, nickel cadmium, lead acid, redox-flow, and flywheel. On the basis of application, the market is segmented into transportation and grid storage. Based on end-user, the market is segmented into non-residential, utility, and residential. The regional segmentation includes the historic and forecast demand for North America, Europe, Asia Pacific, Latin America, and the Middle East & Africa. This segmentation includes demand for energy storage systems market based on all segments in all the regions and countries. The report also includes detailed profiles of end players such as includes Exide Industries Ltd., SMA Solar Technology AG, Autobat SACI, Scheider Electric, SK Holdings, Imergy Power Systems, Enerbrax Acumuladores Ltd., Eguana Technologies, Beacon Power, LLC, Tata Power, Ionotec Ltd., ABB Ltd., LG Chem., Convergent Energy and Power Inc., AES Energy Storage, LLC, BYD Company Limited, Greensmith Energy Management Systems, Eos Energy Storage, S&C Electric Company, and Seeo, Inc.